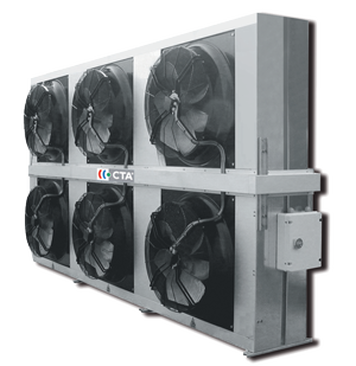 Free coolers are sometimes referred to as Dry coolers, as it is typically a closed loop cooling circuit. By passing ambient air over a coil, the free cooler dissipates heat from a fluid typically water. Where ambient goes below 4C, there becomes a risk of water freezing, and an inhibitor like Glycol is normally used in appropriate dilution. Given the variations in ambient temperature in the UK from -5C to 30C, care is needed particularly to accommodate any thermal expansion and contraction. This is usually dealt with by using an expansion vessel, and some form of pressure relief valve in the thermal circuit.